- Game length of 90 Minutes. - Field Length of 110 yards with no end zones and 53 yards wide. - *Goal Posts 18.5 feet apart with a crossbar 10 feet high. - *Goal Posts stood on the Goal line. - Field Goal was 5 points. - Touchdown was worth 4 points. - Goal After was worth 2 points. - *Safety was worth 2 points. - Kickoffs did not have to travel 10 yards, so the kicking team often would nudge the ball and pick it up and run with it. - *Flying Wedge plays were banned, players could not move forward until the ball was snapped. - Game length reduced to 70 minutes. - *Linesman and Field Judge were added to the Referee and Umpire. - Touchdowns are worth 5 points. - Field Goals are worth 5 points. - *Goal Kick is worth 1 point. - *Forward Pass is legalized. - Forward pass could not be over center (or with 5 yards to the left or right of center) and if the pass was not caught the defending team took possession at the spot of the pass. - *A Forward Pass over the goal line that was not caught was a touchback and the ball went to the defending team at the 20 yard line. - *Neutral Zone of 1 yard was created. - First Down must be reached in 3 plays and the length was increased to 10 yards from 5. - *Time of game reduced from 70 minutes to 60 with two 30 minute halves. - *Field Goals are worth 3 points. - *Passer was allowed to throw over center. - *Passer must pass from at least 5 yards behind the line of scrimmage. - The pass could not travel more than 20 yards beyond the line of scrimmage. - *Touchdowns are worth 6 points. - *Field Dimensions set to 100 yards long with 10 yard end zones. - *First Down must be reached in 4 plays instead of 3, still 10 yards. - *Forward Pass limit of 20 yards was removed. *- Coin toss to determine Defending and Receiving Teams. *- After a team was scored upon, they had the decision to kick or receive the ball. *1927 - Rock Island Independents Franchise Denied by NFL. - Forward pass could be thrown from anywhere behind the line, not just 5 yards back. - Goal Posts were moved up to the goal line. - The ball was put in play 10 yards from sideline when the ball was down within 5 yards of the sideline. 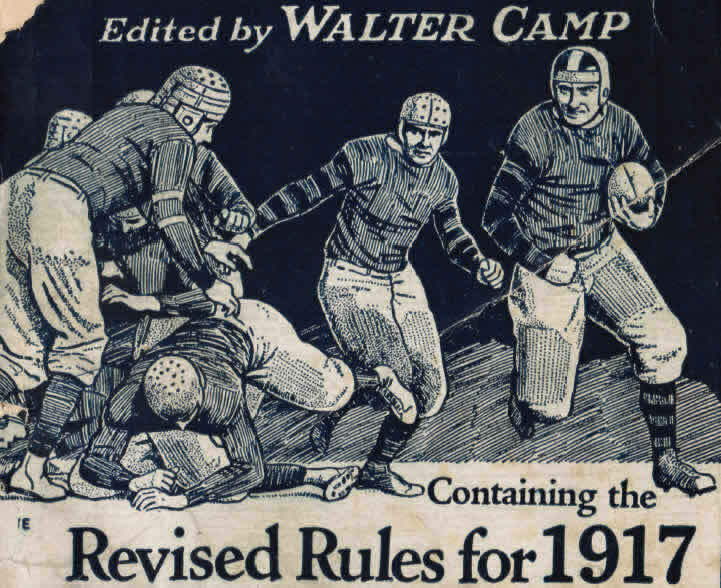 Rule Changes found in "Pigskin - The Early Years of Pro Football" - Robert W. Peterson and the OxfordUniversity Press.